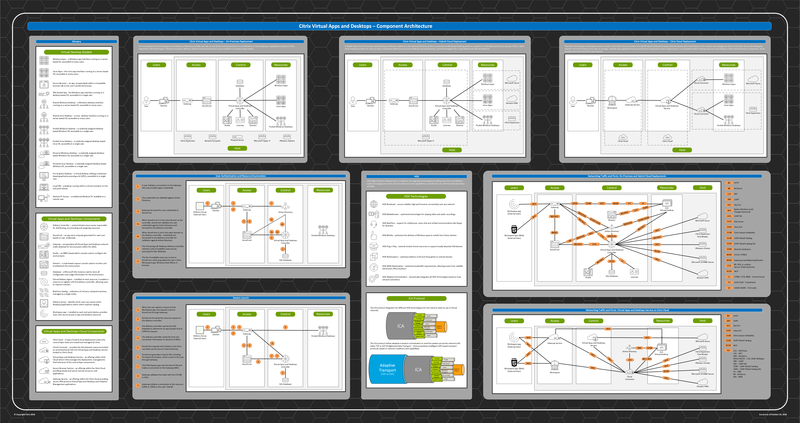 Do you have an conceptual architecture drawing for a Citrix Virtual Apps and Desktops on-premises deployment? How about a hybrid-cloud deployment? What about the Citrix Virtual Apps and Desktops Service in Citrix Cloud? What does the logon/app enumeration flow look like? What network ports do I need? And I’m already anticipating your next question: Can we have the source Visio file? Of course! I just added them to the Citrix Workspace Visio Stencil. New port 🙂 Glad to see someone has attention to detail. Corrected. There’s a typo in the “VM-Hosted App” section: “…desktop-based O, accessible…”. Thumbs up, incredible work of art. 4th item top left, Chang O to OS. When referring to calls to DB maybe include a plug for LHC too. This diagram is great ty! i am new to the Cloud world so forgive me if i say something stupid. i am a little confused about the difference between Azure host connection and AWS host connection. When using an AWS host connection, is it true that connection is traveling through the internet and Azure its traveling through express route or VPN Site to site. If that is the case then why AWS connecting differently than Azure? I just feel like citrix doesn’t have enough information on the differences. You might hear ppl talk about using Express Route / Direct Connect, but that is when you have apps/desktops running in Azure / AWS clouds and your data is on-prem. Thank so much about replying. however, i think i don’t fully understand your last statement. Do you mean if the user access the VDI in the Azure/AWS cloud from an on-site device they are router through the Express Route/Direct Connect tunnel? 1. Administrative: the controllers talk to Azure/AWS to deploy virtual desktops. No VPN/Express route needed. 2. Users: endpoints connect to on-prem storefront to get list of resources. if they connect to Azure/AWS virtual desktops, you need a VPN/express route. however, if you use the XA/XD Service that is part of Citrix Cloud and use the NetScaler Service, you don’t need to setup VPNs/Express Routes for those user connections. The NetScaler unified gateway traffic goes through the cloud connector. Thank you. I was able to confirm that with Citrix. Client wanted an official answer from them. I appreciate your help. Thanks for this, is there anything for WEM and App Layering? Great job for putting this all together.